Wasps captain James Haskell insists his focus is solely on his club, despite this week's announcement of the England squad for the Six Nations. 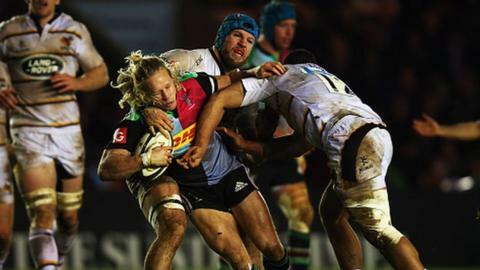 The 29-year-old flanker, who has won 51 caps, was highly influential in Wasps' 23-3 Champions Cup victory at Harlequins on Saturday night. The win sets up Saturday's decisive clash with Leinster at the Ricoh Arena. "It's five seasons since we've been in Europe. These are special moments and you have to seize them," Haskell said. "We need to beat quality sides like Leinster. It's going to be massive for us. They've already sold 15,000 tickets at the Ricoh." Haskell is expected to be named in the 33-man squad named by Stuart Lancaster this Wednesday and is likely to feature in England's opener in Cardiff against Wales - Six Nations champions in 2012 and 2013 - on 6 February. Wasps will almost certainly top Pool 2 if they win at home to Leinster on Saturday (13:00 GMT). If so, the only possible way Leinster could still qualify for the knockout stages would be if they scored four tries and picked up a losing bonus point. It is Wasps' third game at their new Coventry home, having enjoyed bonus-point Premiership wins against London Irish (48-16) and Sale (41-16). But he told BBC 5 live: "I don't worry about things like that. Selection at international level is out of your control. When you are a young player you think you can influence stuff. You can't. "You just have to get on with your club game and play well, and every time you get an opportunity on TV, against your opposite men, you have to put a marker down. "I just want to keep knocking on that door and, if I get picked, I get picked, and if I don't, we're doing good things with Wasps." After a poor start to their campaign, losing 25-20 to Leinster in Dublin then 23-16 at home to Quins, Wasps have significantly turned their form around in Europe. They have won three matches in a row to close to within two points of Leinster and keep alive their hopes of qualification. And Haskell, who made a staggering 25 tackles on Saturday night at The Stoop, hailed the spirit of his side following their Premiership defeat by Bath the weekend before. "We were disappointed. Our character was questioned," he added. "But a sign of a good side is one which can bounce back. "The boys went to a place they hadn't been before - that's what wins you games."